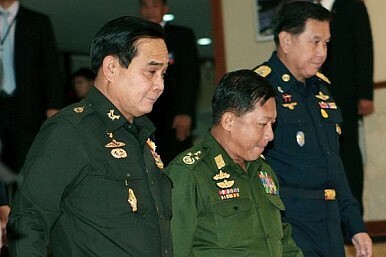 Borwornsak’s revelation raised questions about whether the draft charter was stood as a straw man to be voted down in a seemingly internal democratic process that was ultimately rigged to ensure the military remains in power ahead of a delicate royal succession. The “no” vote will also at least temporarily head off rising tensions between the junta and political parties over its proposed new political order, which threatened to ramp up ahead of a national referendum tentatively scheduled for January if the NRC had approved the draft. Self-exiled former prime minister Thaksin Shinawatra broke his post-coup silence and called on his political supporters in an August 14 speech made in Finland to oppose the charter, which he claimed ran against the will of the majority. Some analysts saw the speech as a call for his affiliated Red Shirt activists, dormant since last year’s coup, to launch protest activities against military rule. The junta barred Red Shirt leaders from holding a press conference on the charter the day before the vote. Thaksin’s coup-ousted sister, Yingluck Shinawatra, echoed his sentiment in press comments ahead of the vote. That put the Shinawatra clan’s Peua Thai party in rare alignment with the rival Democrats. Former premier and Democrat party leader Abhisit Vejjajiva had complained loudly and frequently throughout the process that CDC drafters, among them academics, former judges, and military personnel, were biased against elected politicians. Abhisit was especially critical of Section 280, a provision that would have created a 23-member “crisis committee” of armed forces’ leaders empowered to seize control from an elected executive and legislature during a crisis. The controversial provision, which effectively would have legalized future coups and maintained an NCPO-like structure even after the transfer of power to an elected administration, was inserted at the eleventh hour of the drafting process. CDC chairman Borwornsak justified the provision’s inclusion on grounds it would help to solve national problems and prevent future conflicts, a reference to the revolving anti-government street protests that crippled successive elected administrations over the past decade. He and other drafters claimed most of the draft’s 285 provisions were progressive in spirit and devised from input gleaned from public hearings and other consultations with grass roots communities. The NCPO said that within a month it will appoint a new constitutional drafting committee, which will be tasked with either tweaking the previous proposed version or starting from scratch. Either way, the junta’s new committee will have 180 days to devise a next draft charter, which (unlike the previous version) will be put directly to a national referendum. Should the Thai population vote against the draft, it’s not clear what would happen next on the junta’s roadmap to elections. What is clear after Sunday’s vote, notwithstanding new protests and straw men, is that Thailand will be under military rule until at least 2017.